Through 5/4: Thu-Sat 8 PM, Sun 6 PM; no performance Sun 4/21, Christ Lutheran Church, 4541 N. Spaulding, halcyontheatre.org, 773-413-0454, $20 in advance or free at the door. The world premiere of Kari Bentley-Quinn's one-act marks Halcyon Theatre's last production under Tony Adams's artistic direction and presents a fitting representation of the theater's commitment to diversity and inclusion in storytelling. Simply, it's a story about mommy issues, but the suspenseful script and all-female cast work together to create a portrait of three complicated, sometimes awful, sometimes sympathetic women. Nina, played by Susaan Jamshidi with guts and authenticity, is stuck in a pit of despair after the birth of her son. Her supportive husband isn't helping matters with his relentless energy and happiness (a plot line that could use some additional exploration), and Nina finds herself in the office of Bonnie, her therapist, seeking answers and relief from her nightmares, depression, and anxiety. Bonnie (Jenn Adams in a multilayered and captivating performance) reveals herself to be a therapist who struggles to find her off switch, especially when confronted by the return of her prodigal daughter, Mary (Kianna Rose), who has big news. Bonnie reacts poorly, playing the martyr and calling herself an "emotional hostage" to Mary's years of poor decisions and bad behavior. 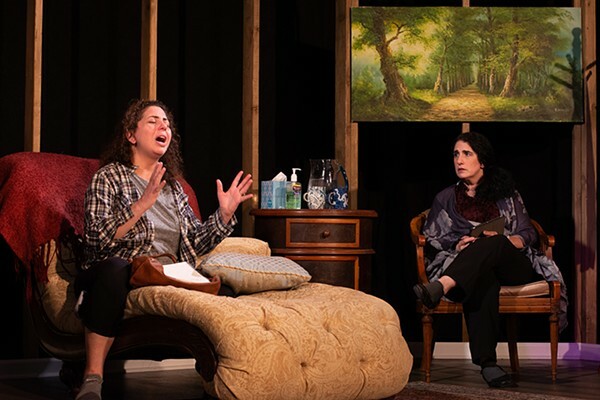 Once Nina meets Mary, everything spirals as all three women struggle to be honest with one another and themselves while maintaining critical personal and professional boundaries. The result is neither graphic nor novel, only a sluggish, muddy blur.